To fulfill the diverse needs of patrons, we are engaged in offering to our clients a wide range of Printed Hand Tag. After checking quality, it is delivered to the clients’ end. We offer high quality Hand Tags along with printing services. 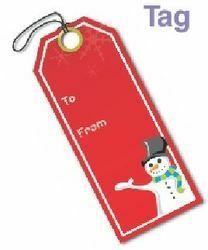 These tags are widely used for clothing and other related items. Our hand tags are designed exceptionally with complete information about the brand with a professional image. These products and services are in accordance with the industry quality standards. In the automotive industry, goods don't arrive in corrugated boxes but in metal and plastic totes and nearly all the parts and components are metal. There is a need for a UHF tag that will be used in this environment. The application for this tags are Gas Cylinder Anti-fake Management, Metal Products Management, Mechanical Management, Vehicle Identification, and Access Control.